Copenhagen Airport is Scandinavia’s main airport and has the vision of being the preferred gateway of Northern Europe and an airport which ensures growth - in a responsible way. Copenhagen Airports (CPH) handles airport security, traffic coordination, cleaning, passenger service, snow clearing, maintenance of technical facilities and fire fighting. As the largest airport in the Nordic countries, CPH plays a crucial role in the effort towards more sustainable air traffic. With the CSR strategy Responsible Growth, CPH has outlined its key focus areas of its airport operations to be the environment, health, safety, and security. CPH is now one of the 102 airports around the world that are carbon accredited. In practice this means that CPH along with the 700 companies operating at Copenhagen Airports has set the goal of CO2-neutral growth: To reduce the total CO2 emissions per passenger from 1.4 kg in 2012 to 1 kg in 2020. One initiative to reach this goal is the installation of a solar power system – provisionally a pilot project – which is expected to annually produce 105,000 kWh, the equivalent to 0.2 % of the airport’s annual power consumption. Read more about CPHs goal of CO2-neutral growth here. 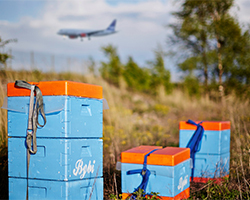 In 2014, the Copenhagen-based social enterprise Bybi (City Bee) gathered its first honey from ten beehives in Copenhagen Airport, and its products are today available at Copenhagen Airport’s two Fine Food stores. The project is sweet in many ways: It originates from the idea of producing high-quality urban honey and introducing city-dwellers to urban insect life. At the same time, Bybi has the mission to provide opportunities for homeless and other long tem unemployed to work as beekeepers and honey producers. The collaboration between CPH and Bybi is to support this mission. “Bees are extremely sensitive to smell. Each beehive actually has some guarding bees that reject migratory bees returning after having been in contact with environmental pollution. The many travellers at Copenhagen Airport can therefore look forward to a 100% pure natural product created by and in the city, “ explains Oliver Maxwell, managing director of Bybi. CSR and Communications Advisor, Lea Holm from Copenhagen Airports became a Premium member of the Social BusinessClub to meet other people who work within the field of CSR and to get new perspectives on how to put CSR into the heart of business. See her testimonial in the left column.